Does it work, and is it healthful? Q: Some of my clients are asking about carbohydrate cycling to lose weight. What does this mean, and is there any evidence that this type of diet works? A: Endurance athletes traditionally have used carbohydrate cycling to optimize energy. The typical practice is to eat more carbohydrate on days that include an intense physical workout and less carbohydrate on days that require less activity. Recently, nonathletes have taken up carb cycling to lose weight. Carb cycling may be effective for weight loss in some clients, but for many, it may cause negative side effects and/or may be contraindicated. Athletes practice carb cycling in a variety of ways. According to Leslie Bonci, MPH, RDN, CSSD, LDN, owner of Active Eating Advice by Leslie, "Sometimes athletes train less and limit their carbohydrate intake pre- and postexercise and before bed to lower glycogen stores." She explains that proponents claim this enables the body to more efficiently use fat as an energy source for exercise. However, this type of carb cycling can negatively impact performance, including strength, speed, and stamina. It also affects recovery, as carbohydrate is the primary fuel source for endurance, stop-and-go, and high-intensity exercise. Nonathletes now are using carb cycling for weight loss, consuming more carbohydrate on days they work out, while cutting back or eliminating carbohydrate on days they're less active. In addition, since exercising is a critical component of weight loss and maintenance, consuming too few carbohydrates may result in the individual having too little energy to do so. Carbohydrate cycling is contraindicated in those with diabetes or hypoglycemia and in those who exercise regularly. "Carbs are important for fluid balance,4,5 so too few carbs coupled with activity may upset fluid homeostasis," Bonci says. 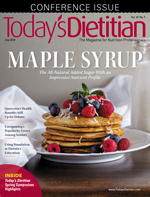 • Remind clients of the essential nutrients that carbohydrates add to the diet. • Discuss portion control when it comes to high-carbohydrate foods, which are easy to overconsume. Use a cup measure or food models to illustrate correct portion sizes—for example, 1 cup of cooked whole grain spaghetti (230 kcal) compared with 3 or 4 cups (690 to 920 kcal), the latter of which may be closer to what clients are serving themselves. • Encourage "being selective with carbohydrates rather than neglectful," Bonci says. For example, engage clients in a conversation to determine which whole grains they may enjoy and should try to consume vs empty calorie carbohydrates such as cookies and cakes. — Toby Amidor, MS, RD, CDN, is the founder of Toby Amidor Nutrition (http://tobyamidornutrition.com) and a Wall Street Journal best-selling author. Her three cookbooks include The Easy 5-Ingredient Healthy Cookbook, The Healthy Meal Prep Cookbook, and The Greek Yogurt Kitchen. She's a nutrition expert for FoodNetwork.com and a contributor to US News Eat + Run, Muscle&Fitness.com, and MensJournal.com. 1. Pool C, Wilborn C, Taylor L, Kerksick C. The role of post-exercise nutrient administration on muscle protein synthesis and glycogen synthesis. J Sports Sci Med. 2010;9(3):354-363. 2. D'Anci KE, Watts KL, Kanarek RB, Taylor HA. Low-carbohydrate weight-loss diets. Effects on cognition and mood. Appetite. 2009;52(1):96-103. 3. Wylie-Rosett J, Aebersold K, Conlon B, Isasi CR, Ostrovsky NW. Health effects of low-carbohydrate diets: where should new research go? Curr Diab Rep. 2013;13(2):271-278. 4. Freedman MR, King J, Kennedy E. Popular diets: a scientific review. Obes Res. 2001;9(Suppl 1):1S-40S. 5. Bloom WL. Carbohydrates and water balance. Am J Clin Nutr. 1967;20(2):157-162.